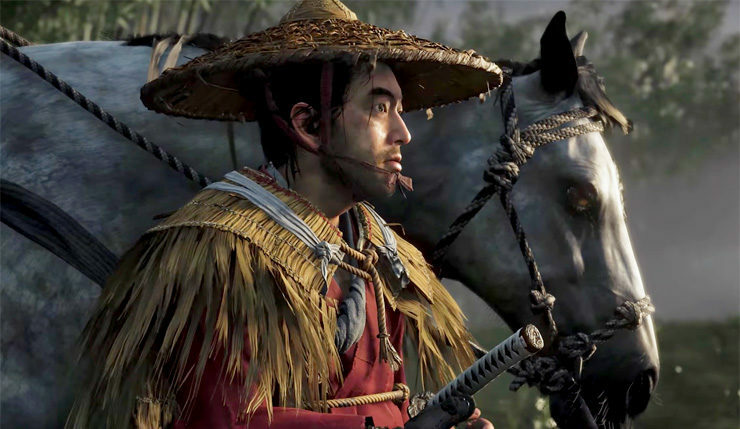 The PlayStation E3 2018 Showcase offered plenty for PS4 owners to get excited about, but perhaps the best part of the presentation was the new 10-minute demo of Sucker Punch’s samurai epic, Ghost of Tsushima. During E3 proper, Sony and Sucker Punch invited media outlets, including Wccftech, to check out the demo again, during which they revealed some interesting new info. First off, the game looked even more impressive demoed in front of me, and yes, it was clearly live gameplay (I can’t necessarily say the same about The Last of Us Part II demo I saw later). As in the E3 Showcase, protagonist Jin was on mission to rescue a monk important to the Japanese resistance, during which we see him ride over grassy plains, get into a scrape with three Mongol soldiers, engage in a bit of stealth, and cross blades with Masako, a woman who wants to kill the monk for her own reasons. Thankfully, it was confirmed you’ll be able to capture all of Tsushima’s gritty beauty via a full photo mode. In another interesting tidbit, it was hinted the game will be around 40 hours long, although the press was cautioned that, that number was only an estimate. 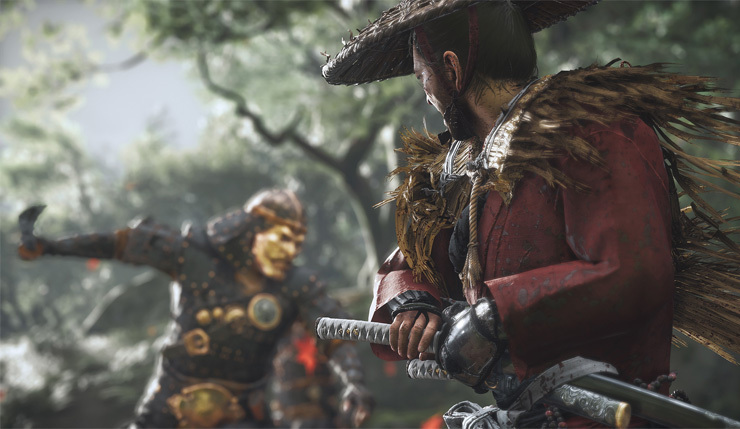 Ghost of Tsushima’s world looks quite dense, almost a Dark Souls-like experience. How will you get around? It seems like it could take a long time to traverse the map. Over the course of that demo, you saw different locations. You got the sense of moving on horseback through these rolling hills, then you were in this pretty dark, confined space in the trees, then things get a little more open again once you’re in the temple. That really characterizes the game. It’s a mix of all the above. It’s not a claustrophobic experience where you’re just going down this narrow corridor with the occasional branch. It is really an open-world game and you can go anywhere you want. Sometimes, you can’t go straight there – sometimes you’re going to have to find the mountain pass and go across it. You can’t always just beeline to a spot on the map, but sometimes you can. It just depends, and it’s that change in character and look and feel as you go from one part of the island to another that helps keep things fresh. 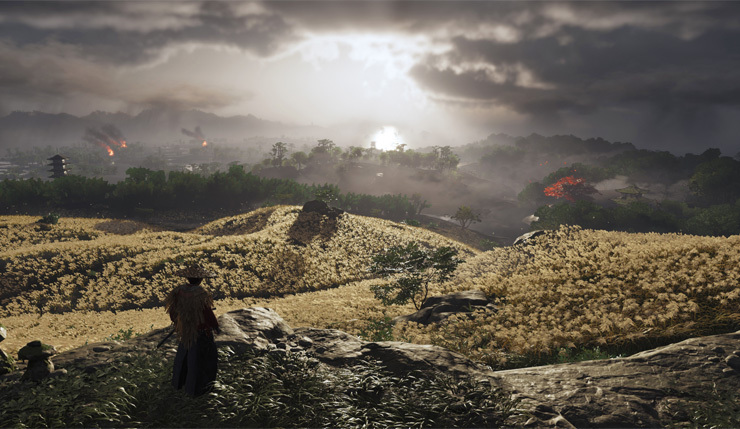 The best open-world games have that sense of discovery — each new area looks different, it plays different, the enemies are different, and the same is true of Ghost of Tsushima. Will there be secrets? Will you be able to fall down the hole and find something good, Zelda-style? That’s an interesting question. It would be surprising if that sort of thing didn’t happen! The central thing for us is we’re building a time machine, and that helps drive a lot of our decisions. And so, a lot of the things we do are about how well they hit that time machine. Will this really make you feel like you’re back in this place and time? So, you’re not going to run around a corner and there’ll be a samurai-themed slot machine. It will be stuff that helps cement your relationship with the game. We didn’t see much of it in the demo, but will there be villages? NPCs? You would expect so, right? So it’s there. It’s Jin’s story, and his relationship with the Mongols, but more broadly speaking it’s about his relationship with the people and the island. So, there is a main storyline, but a lot of the content is what you [saw in the demo]. Most of your play experience won’t be playing the next mission in the Jin campaign, it’s going to be meeting a character like Masako and being intrigued and thinking “Where does this go?” So, all the basic game stuff happens, all the mechanical stuff happens, all the rewards are there, but we start with the idea of putting you in ancient Japan. That’s the troughline. How linear is the main campaign? Are there ways to skip ahead or sequence break? We’re not ready to talk about that, partly because we’re still figuring out some of those questions. We spent 10 years making the InFamous games, which are all about player choice, so we know all the things we would do, but figuring out if we want to, whether that’s the right thing to do for this story, is something we’re not ready to answer. Sony is one of the few big publishers still doing single-player story games without a lot of addons. You pay $60 for the game and that’s it. Is that what you’re doing with Tsushima, or will there be DLC? Time will tell, it’s just too early to answer that question. So, how hard is this game? It looks like it could be pretty tough. There’s a range, because different people play games for different reasons. One of the challenges of making games is realizing not everyone plays for the same reasons. Especially when you’re talking about open-world games, which are big games, so you have players who are basically just tourists, there are people who are really story-driven, there are people who are really action-driven. For us to be successful, we kind of need to appeal to all those groups, and one of those groups are the people who are really, really into the action and really want a challenge. That’s part of the experience for them. The story is about Jin being forced to change and being challenged by these overwhelming numbers of Mongols — I want to feel that. And the game will absolutely give that to you, if that’s what you want. We will wreck you if that’s what you want. At the same point, if you’re playing to be a tourist, you still need to feel like you’re challenged, you don’t just want a cakewalk. The game needs to scale down to provide the right challenge, but still make your choice feel meaningful. If you can just cakewalk through every fight, then the parts where Jin is sneaking around just don’t make sense anymore. Why would I do that? The story is about how the Mongols are forcing you to change, so they need to force you to change. No matter who you are as a player, if your experience doesn’t match Jin’s, the story won’t land. So, there does need to be challenge for everyone, but what that’s going to mean is going to depend on who you are as a player. So, will there be an actual difficulty setting? Oh, there’ll absolutely be a difficulty setting. We can try to auto-detect it, but it’s difficult to do that. But, I think the point is, it’s not a masocore game. It’s not about killing the player, it’s about the time machine. If you don’t die, it doesn’t feel like a time machine, and if you die too much, you don’t care anymore. We have to hit the right balance between those extremes. Will you be able to change the difficulty on the fly? I would guess yes, but I don’t know for sure yet. 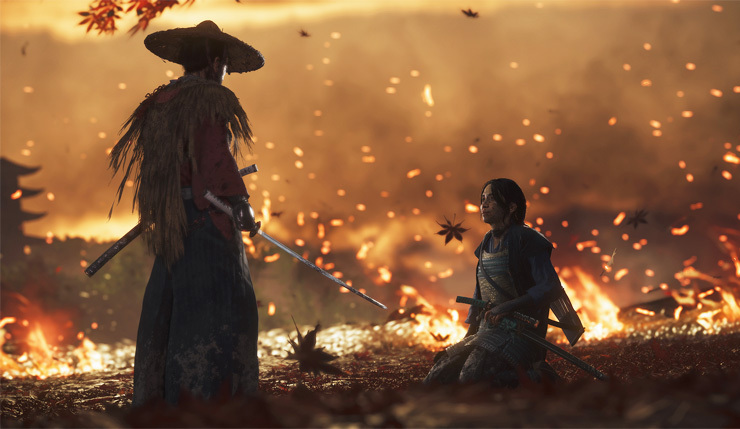 What can players expect from Ghost of Tsushima in terms of resolution and framerate on PS4 Pro? This [demo] was PS4 Pro. We can’t really comment on the rest, but I respect your need to ask the question. Ghost of Tsushima is coming exclusively to PS4. The game has yet to receive a release date.